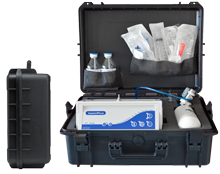 Complete Ozone therapy set, housed in a robust hard case. The new definition of mobility and endurance. We're are glad to help you! A mobile treatment set that is equal to a stationary? The basic of mobile EVOZONE sets new standards in this sector. The ozone device (same as basic plus) and a 0.8-liter oxygen cylinder with pressure regulator are stowed safely for transport, and in no time ready to use. Additional storage space for supplies and personal belongings to makes you flexible and mobile. The basic mobile is for the most difficult conditions outside your office suitable. Whether in the most remote places in the world – or at your patients around the corner. All the important ozone treatments with a mobile device. The basicMobil's ozone generator is similar to the basicPlus - accordingly it has all the features of thebasic plus device. 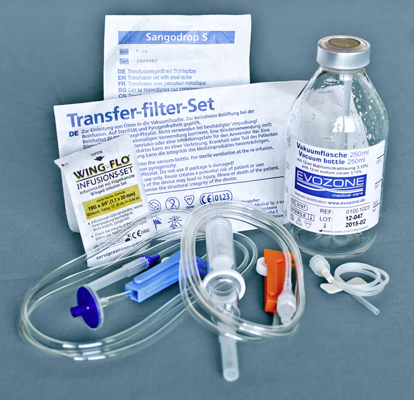 The Major Autohemotherapy is easy and safe with the basic plus:The ozone refered easily with a disposable syringe from the device, via a transfer line with integrated bacterial filter you fill the vacuum bottle withthe desired amount of ozone - only a small additional effort compared tothe automated execution of high expensive ozone devices. 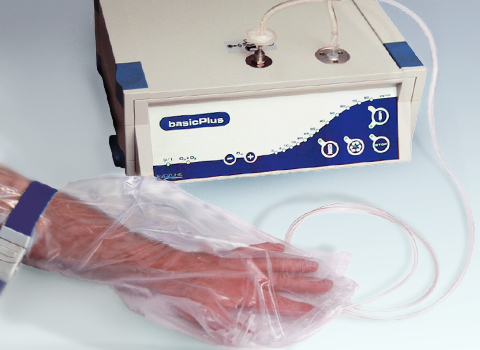 The Minor Autohemotherapy and other applications by injection are carried out with the basicPlus in only a few hands. Choose the Ozone concentration by pushing buttons plus or minus You can quickly perceive the set concentration thanks to the LED-scale. 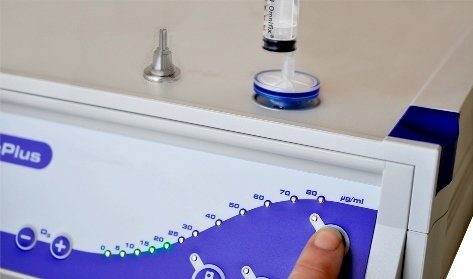 Fill a syringe with only a push of a button. The labeling of the operating elements with clear icons makes the handling of the device easy and gives safety to the user. 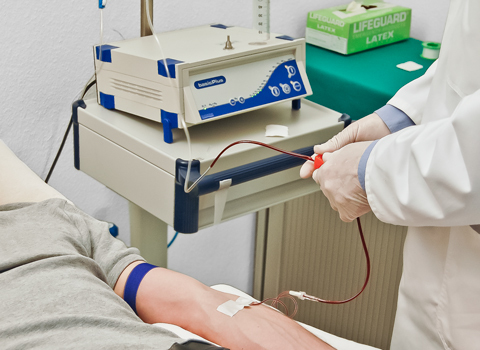 Bag treatment: With its strong pump and integrated catalyzer, quick filling and extracting is no problem during the bag treatment, with the basicPlus. 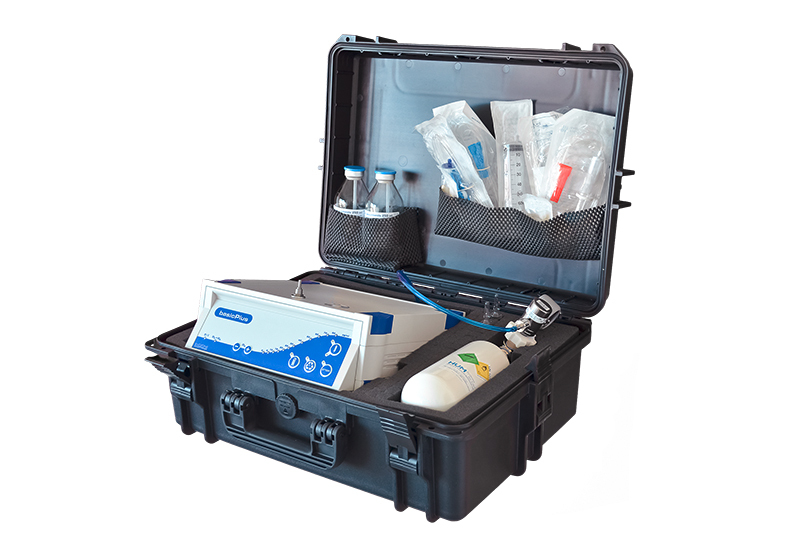 Even at high Ozone concentrations this device delivers a high amount of gas (flowrate of 1 litre per minute) – important for an effective workflow in daily use. 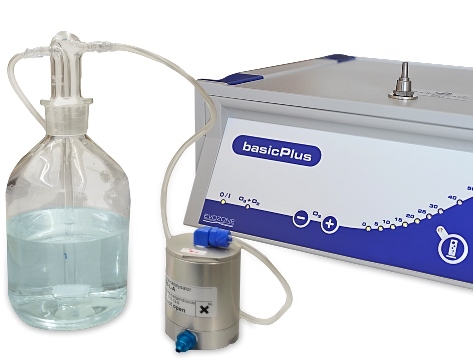 Water ozonisation: The basicPlus is perfectly qualified for water ozonisation due to its constant high Ozone output. Therefor the device is equipped with a time controlled permanent-ozone function. In combination with the optional Aquanizer, the fabrication of ozonized water takes short time and little effort. Our advice: with a simple plug you can use the Aquanizer for storage as well. If it is stored in a refrigerator, then the ozone water will keep its effectiveness for several days. High pressure manual connection G 3/4 "